The Multi-State Working Group, formerly known as Tri-State Working Group, is comprised of NASA Carbon Monitoring System scientists and carbon data end users from the northeastern United States. The WG was created at the 2016 NASA CMS & USFS Applications Workshop & Tutorial held at Newtown Square, Pennsylvania. The overarching goal of the new Multi-State WG is to share stakeholder perspectives and needs, and relevant scientific advances for forest carbon monitoring and modeling. The working group provides a focused opportunity to continue and expand discussions on lessons learned, identify common needs and solutions, and make progress in incorporating science into policy and decision making. For more information on the CMS Multi-State Project please see Hurtt-04, Hurtt-03, & Dubayah-03 CMS Project Profiles, or visit the High-Resolution Carbon Monitoring and Modeling Webpage. This Applications Workshop discussed the uses and applications of new CMS data products available for the tri-state area stakeholders, and assessed results and lessons learned from the agencies and organizations using the data. The CMS leads and scientists learned about the climate change landscape and the mitigation targets and goals in each of the three states, and what is the current approach to forest carbon MRV in these states. The workshop also discussed the added value and extended benefits of LiDAR data for the states agencies and counties. Workshop Summary CMS Application workshops and tutorials provide an opportunity for CMS Science Team members and stakeholders to engage on thematically detail objectives that help advance CMS science into appropriately scaled policy arenas. 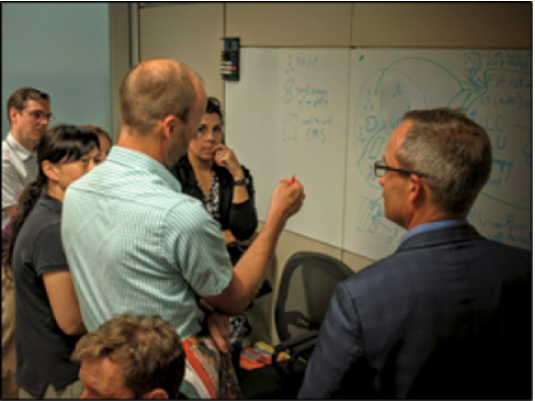 On September 9, 2016, the CMS Applications Team working in partnership with the Hurtt-03 CMS project, hosted a workshop with stakeholders from the tri-state area of Maryland, Delaware and Pennsylvania. 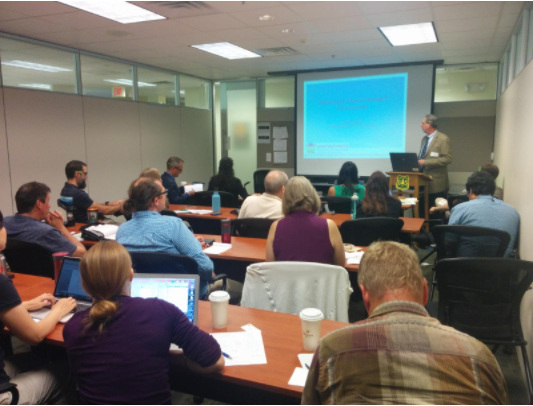 The workshop was held at the USDA Forest Service Northern Research Station in Newtown Square, PA. Collaborators for this workshop included the University of Maryland and the USDA Forest Service. The goal of the event was to understand the stakeholders needs for carbon monitoring and measurement, reporting and verification (MRV) for MD, DE and PA and find ways of applying the CMS Lidar products to the appropriate areas of each State's Department of Natural Resources (DNR). The Applications Workshop & Tutorial discussed the uses and applications of new CMS data products available for the tri-state area stakeholders, and assessed results and lessons learned from the agencies and organizations using the data. The CMS scientists learned about the climate change landscape policies and the mitigation targets for each respective state. Current approaches to forest carbon MRV practices were presented by each state representative in an effort to help provide perspective to the CMS scientists. The workshop also discussed the added value and extended benefits of LiDAR data for the states agencies and counties. Some of the stakeholders engaged included: Pennsylvania Department of Conservation and Natural Resources (DCNR), Pennsylvania Bureau of Forestry, Delaware Department of Natural Resources and Environmental Conservation (DNREC) Division of Energy and Climate, Delaware National Estuarine Research Reserve, Delaware Geological Survey, Maryland Department of Natural Resources, Maryland Forest Service, USDA Forest Service, City of Baltimore, Pinchot Institute, Versar, amongst others. The CMS projects involved in this effort include Escobar-01, Dubayah-03, Hurtt-03. 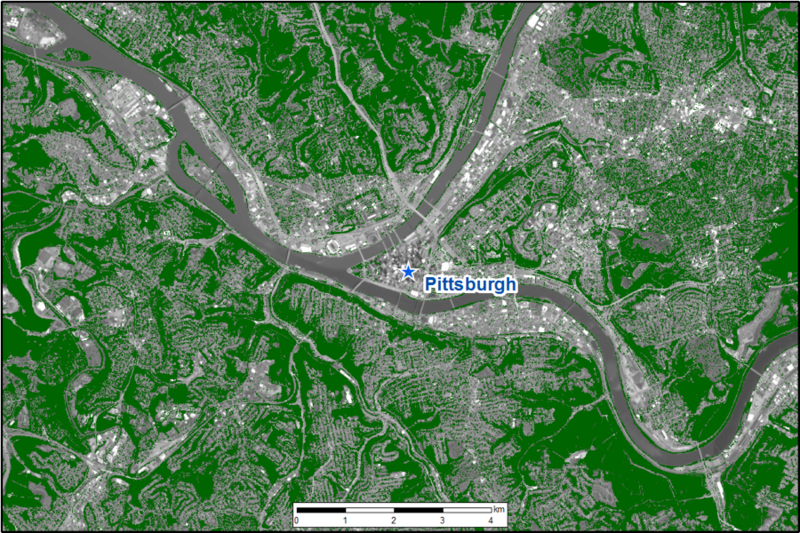 This Hurtt-03 project builds off the earlier Dubayah-03 project and uses airborne lidar retrievals to develop aboveground biomass maps, 1m canopy height and forest/non-forest maps, and 1m land cover maps for the tri-state area of MD, DE, and PA. The CMS Applications Effort (Escobar-01) is assisting Dubayah and Hurtt in the engagement efforts with the state agencies, counties and cities to translate the needs of each state's DNR for carbon monitoring and MRV. Identification of large and important synergies between advances in carbon monitoring and stakeholder needs for carbon monitoring in region. Recognition of opportunity to cooperate and develop a shared, consistent, approach to carbon MRV for the tri-state area. Discussion of differences between states in terms of specific policy drivers, resources, timeline, needs, opportunities, etc. Creation of a Tri-State Working Group consisting of scientists and stakeholders to discuss, share, plan, support, and encourage the development and use of relevant data products to meet stakeholder needs for carbon monitoring (MRV) in the region. For questions on the CMS Applications effort please contact CMS Applications PI, Vanessa Escobar. To keep up to date of CMS Applications Events please visit the CMS Calendar, or subscribe to the NASA CMS Applications mailing list by sending an email to Edil Sepulveda. Quarterly Presentation: Don Strebel, Versar, Inc. Please email Edil Sepulveda for any questions or suggestions regarding the Multi-State Working Group.